Brahim Elaabdouli will take you on a tour of discovery through Berber culture and the landscapes of the Anti-Atlas mountains. Brahim, who has a degree in Moroccan history and specialises in the desert and culture of the country, will be your guide throughout your trip. Cross the Anti-Atlas towards the village of Ighrem for lunch and the Issafen valley. 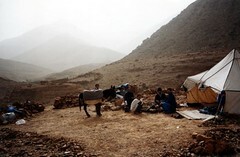 Spend the night in a bivouac, our own Moroccan campsite, hidden away in the mountains. Trekking through Berber villages and exploring a culture which is still relatively unknown and untouched by the modern world. Spend a day in a true Berber village and have lunch in the home of one of the inhabitants. Return to the point of departure.The price depends on the number of people.